CVS said in a statement that the decision to no longer carry tobacco products in its 7,600 stores across the United States makes it the first national pharmacy chain to take such dramatic action to discourage smoking. "Ending the sale of cigarettes and tobacco products at CVS/pharmacy is the right thing for us to do for our customers and our company to help people on their path to better health," said Larry Merlo, President and CEO of CVS Caremark. 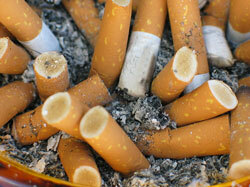 "Put simply, the sale of tobacco products is inconsistent with our purpose," he said. Merlo added that CVS stores shelves will be tobacco-free by October 1 of this year. President Barack Obama hailed the decision as a bold move that will save lives. "I applaud this morning's news that CVS Caremark has decided to stop selling cigarettes and other tobacco products in its stores, and begin a national campaign to help millions of Americans quit smoking instead," the president said in a statement. "As one of the largest retailers and pharmacies in America, CVS Caremark sets a powerful example, and today's decision will help advance my administration's efforts to reduce tobacco-related deaths, cancer, and heart disease, as well as bring down health care costs - ultimately saving lives and protecting untold numbers of families from pain and heartbreak for years to come." Obama - who worked for years to break a cigarette addiction - praised officials at CVS "who helped make a choice that will have a profoundly positive impact on the health of our country." Smoking is the leading preventable cause of premature death in the United States, killing nearly half a million Americans a year. A report released last month by the US government found that smoking cigarettes can cause even more health problems than previously known, including liver and colon cancer, blindness and diabetes. The report by the US Surgeon General said that more than 20 million people in the United States have died from smoking-related diseases and illnesses caused by second-hand smoke.